There I stood, looking out the window a few hours before the official beginning of Spring. 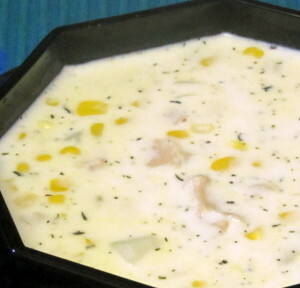 Gazing out at the heavy wet snow… and feeling a need for comfort food – hot, creamy, New England clam chowder. 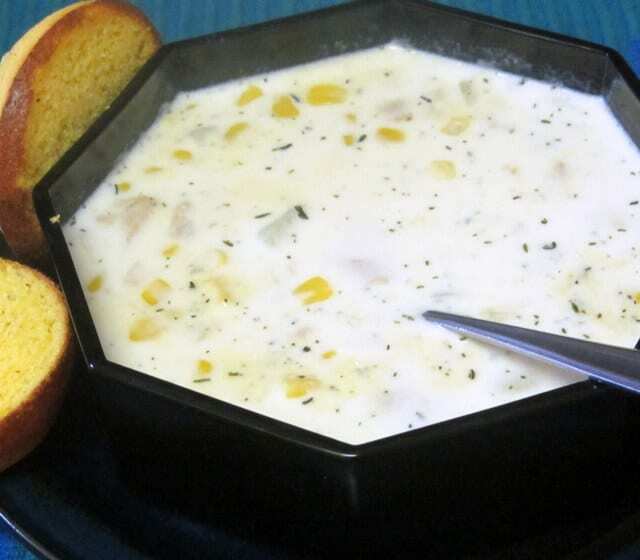 But – in that perhaps not so perfect world, I would not be able to decide at noon on the snowy first day of Spring that I would have clam chowder for lunch. 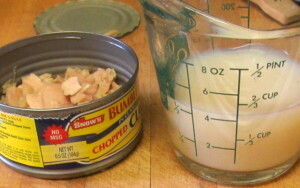 Now, I have had fresh clam chowder… but at home (for the reasons above) I’ve usually just heated a can. 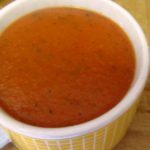 But over the years, my taste may have improved, and the quality of the canned soup has definitely deteriorated – and between the two, the cans have become a much less attractive choice. For one thing, there seem to be fewer and fewer actual clams… and the soup itself has become gloppy with potato starch, instead of rich with cream. I’d started gradually adding clams and cream, to improve it – and I realized it made more sense just to make it myself. I start with canned clams, because I can keep them on the shelf. Now, here is an illustration of one of the problems with packaged foods these days. The can is labeled “Clams in clam broth” and it sort of is, but… it’s really clam broth with some clams. Of that 6.5 ounces of “clams in broth,” 4 ounces are broth… yikes. Now, for soup, I can work with that… When I was young, if you wanted to make a recipe with canned clams you bought the can of clams (which was full of clams, back then) but you also bought a bottle of Clam Broth to use as the stock. So now, I have it all together in one can, which has its points – as long as you fully understand what you are (or are not) getting. And, sad to say, this is still quite a bit more clam than you get in a can of clam chowder, even from good brands. I started by chopping a small onion, and sauteing it. (I used butter for the flavor, instead of my usual olive oil.) I added a large potato, cut in bite sized pieces – 2 potatoes would, in fact, have been fine, but I didn’t have another. If I’d had celery in the house I would have put some of it in, too… but again, I did not. Meanwhile, I opened two cans of clams in clam broth, and drained the broth, reserving both broth and clams. I had a full cup of clam broth. Once the onion was soft, and the potatoes were showing a bit of color, I poured in the clam broth, brought it to a boil, and simmered about five minutes until the potatoes were soft. Then I added two cups of whole milk, and one of half and half. 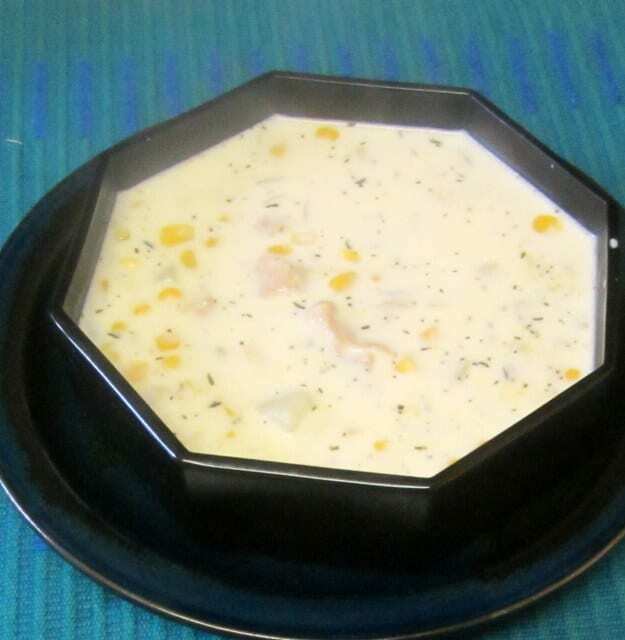 If you want the soup to be richer, you can reverse those proportions. 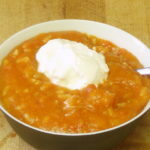 I used half and half because I often have it in the house (and if you don’t, you can usually get it at the corner store, for impulse soup) – if you would like light cream, use it instead. Substitute either two and a half cups of milk and half a cup of cream for the same proportions I used, or a full cup of cream, if you want. For the recipe I wanted to set a baseline – much less cream than this would seem thin, more will be wonderful for many people – but too rich for some (occasionally including me, I’m sorry to say.) Adjust for your own taste – and digestion… I also added half a teaspoon of thyme. I gradually brought the milk to a simmer, stirring to avoid burning. 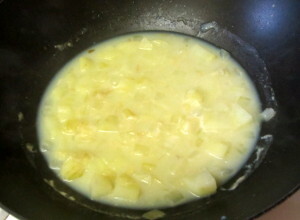 Then I added 3 roux cubes to thicken it, and stirred to dissolve them. This was not enough for a really thick soup – it is still much thinner than canned soup, but the richness comes from the cream, not the starch. You can decrease the thickening or skip it all together – but I think you can see the difference in the pictures. 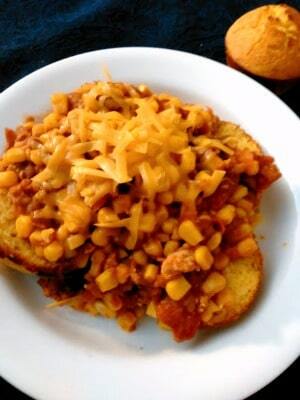 Using the cubes also adds some butter – which is, itself, a traditional ingredient. I, of course, used the gluten free roux cubes, you can use whatever you like – though this is one of the recipes in which the lighter color and flavor of millet flour might be preferable to the flavor of whole wheat flour, even if you do eat wheat. Not particularly difficult or time consuming. 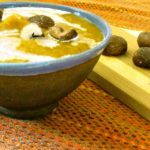 Other than the dairy products, it is made of pantry items – and most of us either have or can easily get milk and either cream or half and half. If you don’t have roux cubes in the freezer you can make a roux and stir it in – three tablespoons flour to two or three tablespoons of butter. The cubes are easier, though… 15 minutes to soup, on a snowy day! 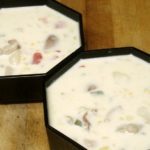 A quick and easy New England clam chowder, made with ingredients you can keep on hand, so you can make it whenever you feel like it! Open and drain clams, reserving both clams and broth. 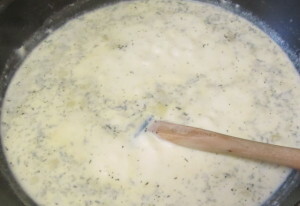 Heat butter in a soup pot. Add the onion and potato, and cook until the onion is soft. Add the reserved clam broth, and simmer until potato is tender. Add the milk, half and half, and thyme. Bring to a low simmer, stirring regularly. Add the roux cubes, and stir until slightly thickened. Add the corn, and heat. Add the reserved clams, and just heat to serving temperature, being sure to avoid bringing it to a boil.